What do our clothes say about us? How do the clothes we wear affect our moods and emotions? How does the fashion industry encourage us to aspire to look in a certain way? 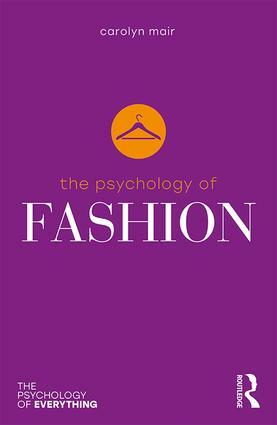 The Psychology of Fashion offers an insightful introduction to the exciting and dynamic world of fashion in relation to human behaviour, from how clothing can affect our cognitive processes to the way retail environments manipulate consumer behaviour. The book explores how fashion design can impact healthy body image, how psychology can inform a more sustainable perspective on the production and disposal of clothing, and why we develop certain shopping behaviours. With fashion imagery ever present in the streets, press and media, The Psychology of Fashion shows how fashion and psychology can make a positive difference to our lives. Professor Carolyn Mair is a freelance consultant specialising in the psychology of fashion. She works with educators, clothing brands and media outlets. She pioneered the Masters and Bachelors programmes on the psychology of fashion at London College of Fashion.